• Make a plan to control pests present on the farm. • Keep track of existing pests and products used for control. • Use traps to control rodents. • Have a sketch of the location of the traps and bait-stations. • Place meshes to prevent the entry of birds into production areas. • Specific insecticides must be used for the control of flies for this purpose. • Keep the farm free of garbage, waste and dirt. • Recognition of live or dead rodents. • Droppings like odor or insulating material. • Runways, inside and outside. • Tunnels, holes ➤ signs of movement. • Check with ultraviolet light and have a look for faeces and urine. musculus (house mouse), are the most important pests both in urban and rural regions. 1. Rodents are carrier and important vectors for serious pig diseases. Also, parasites are introduced via rats and mice, such as ticks, fleas and tapeworms. 2. Spread or accelerate the spread of diseases. 3. Attract other predators, rodents are also a food source. • Plant free area around the buildings. • Clean and carry out any garbage, waste and dirt!!! • Grass must be shortened regularly. • Search for holes in the grass and put baits in. • Buildings need to be rodent proofed. • Close holes, cracks and improve the surrounded area of the buildings. • Keep any doors, windows and entries for humans closed. • Lay a band of gravel around the buildings (at least 50 cm). • Set traps right against the wall, corners, dark places, where mice like to hide. • Continuously use of toxic baits ➤ safest rat and mice reduction. • The population is kept on a low level. • Using bait stations in and outside the buildings. • Check the bait stations on a monthly basis. • Change the brand or kind of baits. • ➤ keep it attractive for rodents. Active ingredients: Anticoagulants are inhibiting blood clotting. taken by rodents several times to be effective. The rodents will die after a few days, so their death is not associated with the bait by their fellow rodents. The rodents can develop resistances against the bait ingredients. Flocoumafen and Difethialone kill effectively after the first intake by rodents. generation, the usage of anticoagulants of the second generation is necessary. Baits with anticoagulant ingredients need to be placed in closed bait stations.So, nottarget animals are not negatively influenced or even killed by the rodenticides. effective reduction is not achievable. All kinds of transports to a farm are a high risk of introduce diseases into the farm. Therefore, the frequency of transports must be reduced to a minimum. to the farm. A quarantine time should be calculated as well. In general trucks and vehicles need to be cleaned carefully and checked first. Subsequently they have to be disinfected. After that procedure the trucks/ vehicles are standing still for at least 2 hours and then drive to the farm. quarantine time overnight needs to be installed. they have been before. So, pigs are loaded on to company owned trucks and brought to special and marked loading area to be loaded to foreign trucks. • First deliver feed to the high value farms (like breeding farm and boar station). • Then the others (growing out, fattening). • If possible feed delivery only once a week. • Trucks need to be clean, otherwise disinfection is ineffective. • Sunday: feed trucks are not moved. • So, you need a feed storage at all farms at least for 10 days. disinfection), before going to a farm after driving to customers. • Wash the truck directly after usage, first from the inside and then from the outside. • Use high pressure machines (>100 bar) and hot water. • Use alkaline soaking liquid for washing. • After washing Disinfection from the inside and then from the outside and every time. • Drivers are not allowed to enter the stables; they have to stay on the truck!!! 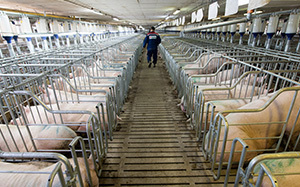 • For loading pigs, use farm owned equipment and leave it there. • Wash your hands after, also use hand disinfection. o One for outside the truck and one for entering the loading space. o Wash and disinfect them every time. • Drivers are not allowed to carry any food with them (high risk material). • Vehicles, which don’t belong to the company shall not be near the farms. hands with soap (liquid soap) and hand disinfection. • No meals inside the farms for customers. • No potential germs near to the farms. • NaOH is very aggressive, to shoes and feet (shoes with holes). 5cm deep in one container and change the dirty liquid every day. • Shoes or boots must be absolutely clean, otherwise no disinfection. • Replace the disinfectant inside the bowls continuously. • Reduce person’s traffic to minimum. • No private vehicles inside the farm (motorcycles for example). • Find a save spot outside the farm for them. • Shower directly after entering the black area of the farm. • Shower again, when you enter the white area and start your work. • Using Shampoo and shower gel. • Defecate and urinate only on toilet, not anywhere else. germs from one to another. • Workers, who went out, need stay in the black area for 24 hours. • Washing hands before having a meal. • Washing hands, and use hand disinfection afterwards. • Food comes from the outside and is a risk. Washing hands after using the toilet ➤ human faeces: high risk for diseases. • Check foreign workers and their belongings, no risky materials inside the farm. It starts with cleaning and disinfection and goes on with vaccination and medical treatment. • Remove faeces and food remains from the stable, manually. • Start cleaning directly after the animal transfer. • Put faeces, urine, dust and old feed out of the stable. • Put garbage and other things out of the stable. • Control and perhaps fix the electric facilities. • Washing only with water. • Warm water is helpful. • Use a special soaking liquid to crack protein and fat. • Soak only what you can clean in the next 60 minutes. • Do not forget the ceiling and the walls. • Don't wait some days, do it directly. • A good cleaning is 99% of the disinfection. • Use warm water, if possible. • Use pressure washer and plenty of water to clean everything. belong to this production area. • Don't clean the underfloor storage. • Clean the water pipes. • Clean the feed pipes. • Clean the feed silo inside and put the old feed out. • Don’t forget the ceiling and the walls. • At last put the manure out of the underfloor storage. the disinfectant solution is diluted on the surface. • Before you start disinfecting the room must be completely dry. • Use cresols for disinfection, they work at any temperature (NEOPREDISAN). Attention: Lower concentrations are useless and can also cause resistances!! • Disinfect walls, floors, pens, facilities, tools, work boots, transport vehicles etc. • Clean the pathways directly after stalling / moving pigs. • Use disinfection only after drying. ➤ We don't know what happened at night!! • Do not let the soap dry out. gates, crowd boards, brooms, shovels and dirty and clean boxes. • Apply disinfectant to all. wheel, door handles, and dashboard. pig rearing, should be checked regularly! • The silo areal must be clean at any time. • Adjust the feeders, so that the pigs are able to finish it. • Bad influence on feed intake and weight gain with poor feed hygiene. • Economical aspect ➤ Reducing of feed losses. • Water and water pipe hygiene. (chemical-physical and bacteriological �C danger: salmonella!). • Attention!! Products used in the current mast must be approved for this!! • The water system should be cleaned from time to time. • Hygiene in the water supply always also depends on the equipment. • Long troughs with aqua level need to be checked after feeding. • Food remains must be removed, so all pigs are able to drink. • Bowls are more accepted by pigs, the water intake is higher. ➤but they must be checked and cleaned every day.